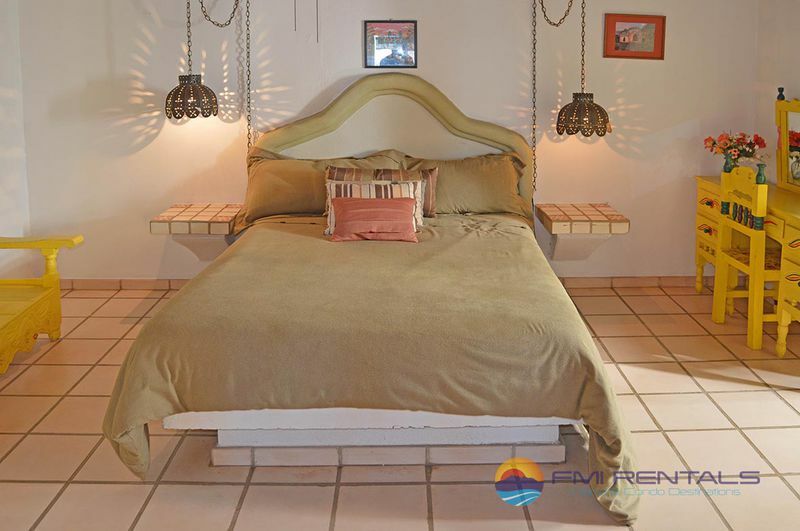 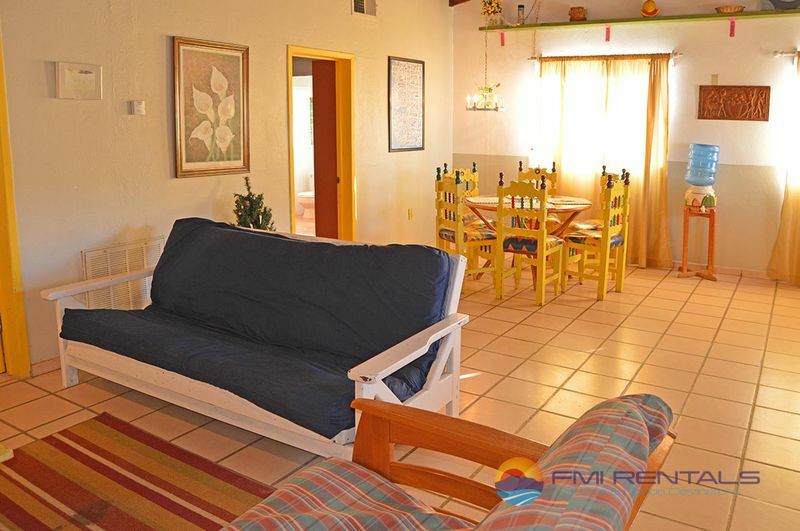 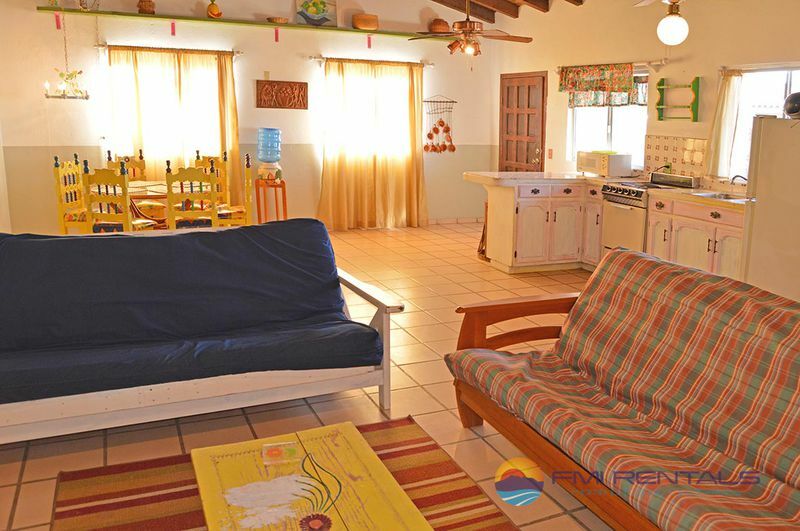 Located in the quiet gated community of Las Conchas, this is one of the happiest vacation rentals in Rocky Point! 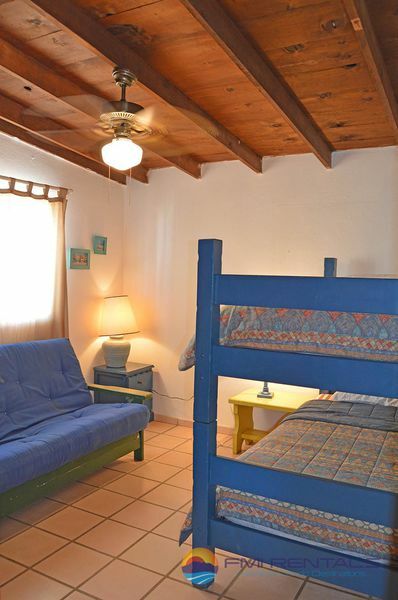 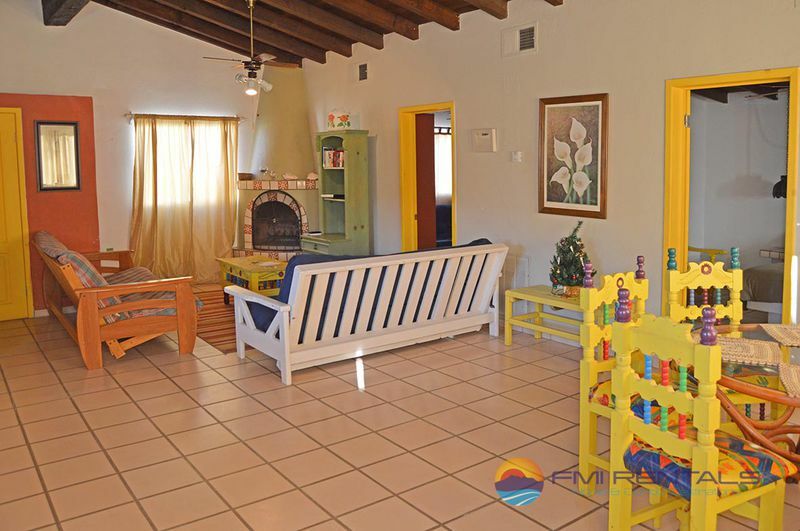 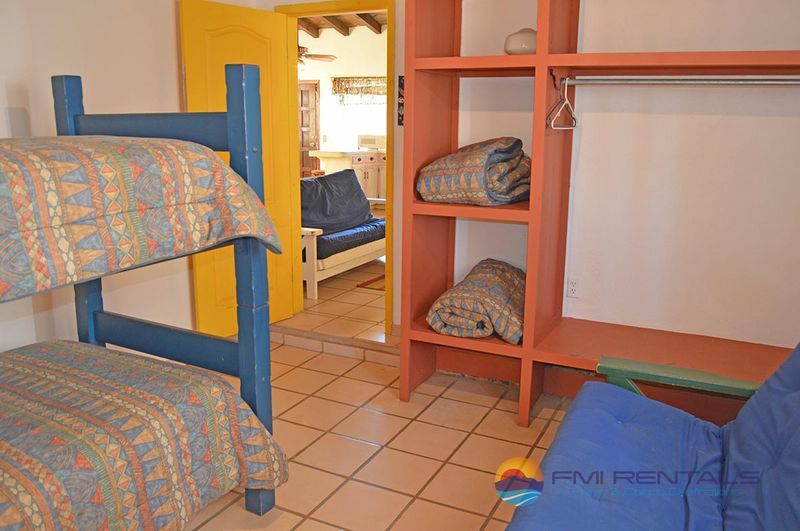 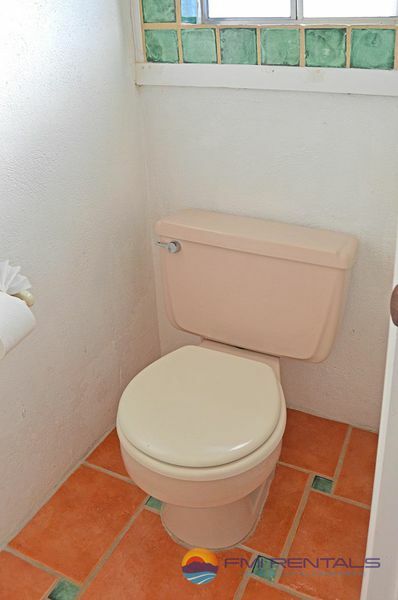 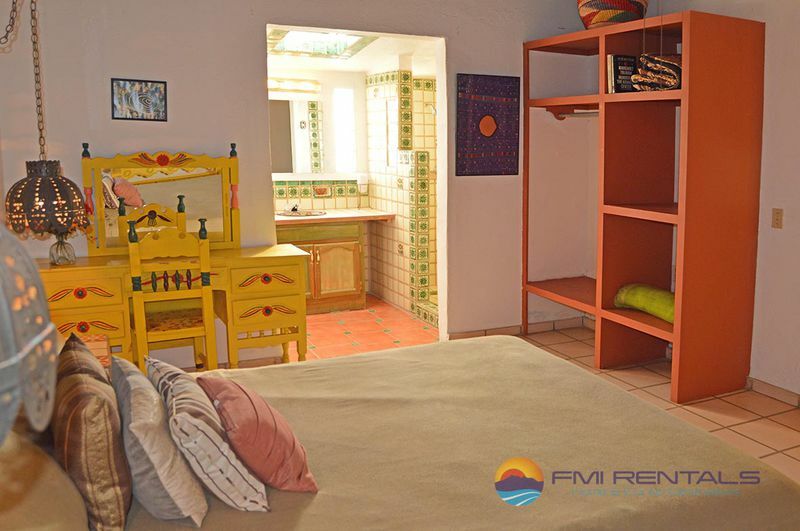 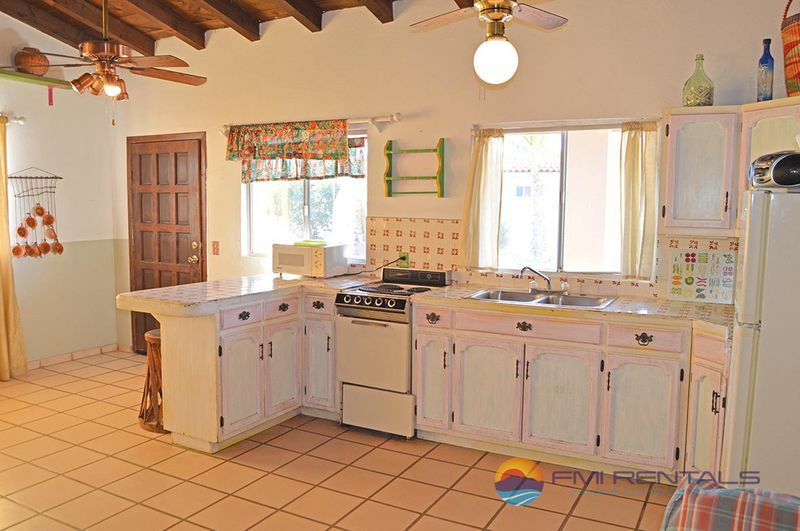 Bright colors throughout will bring a smile to your face from the first step inside this 2 bedroom, 2 bathroom casita that can sleep 10 people comfortably! 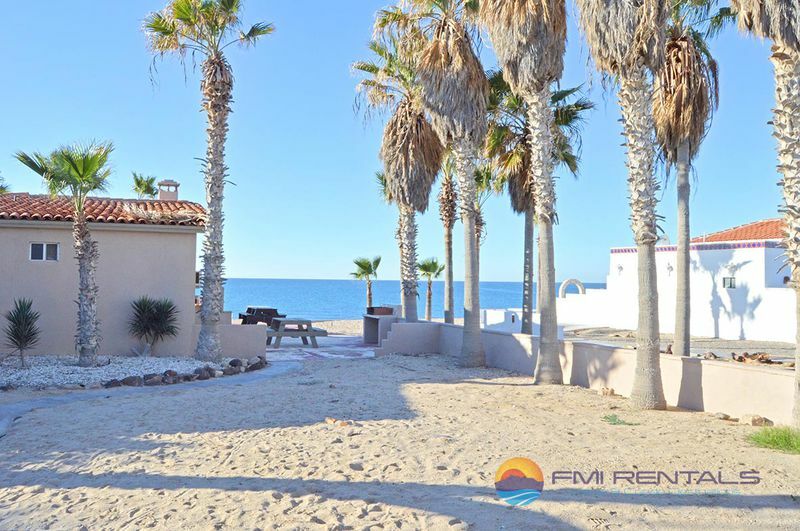 It’s just a short walk through sandy paths dotted with picnic tables and palm trees to an ocean that is so close you can hear the waves slapping at the beach from your front porch and feel the salty mist of a sea breeze cool your skin on hot summer days that you wish could last forever. 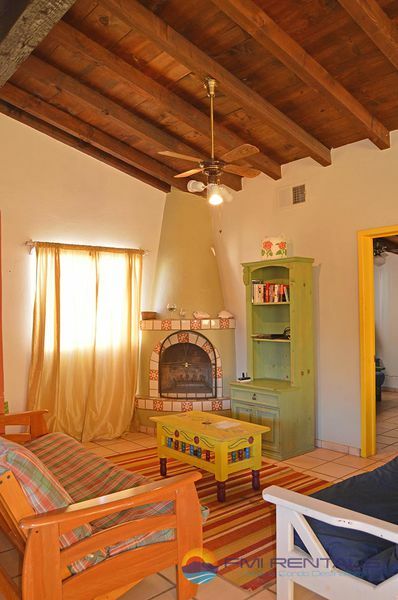 A tile roof covers a front porch tiled in the Saltillo tiles of Old Mexico as you walk into this cheerful cottage, a tiled arch standing watch nearby. 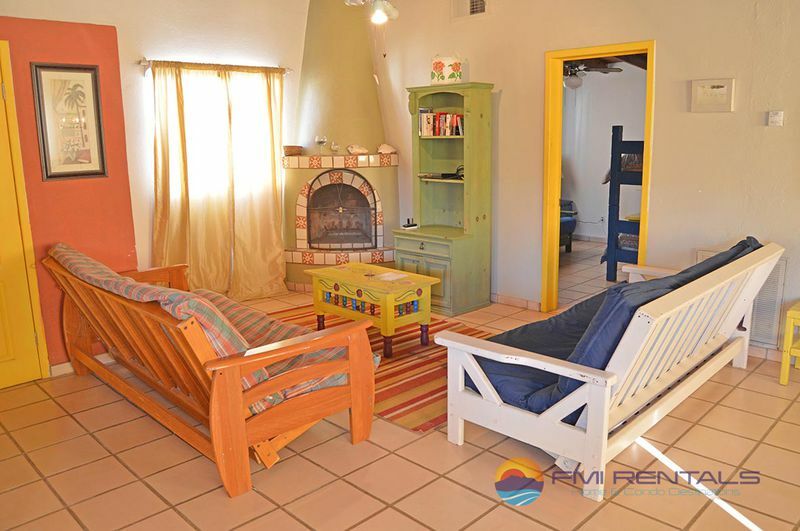 The living room is brightly colored, with an old style beehive fireplace taking center stage; nights can get cool by the ocean, and a fireplace offers both romance and practical warmth on the chillier nights. 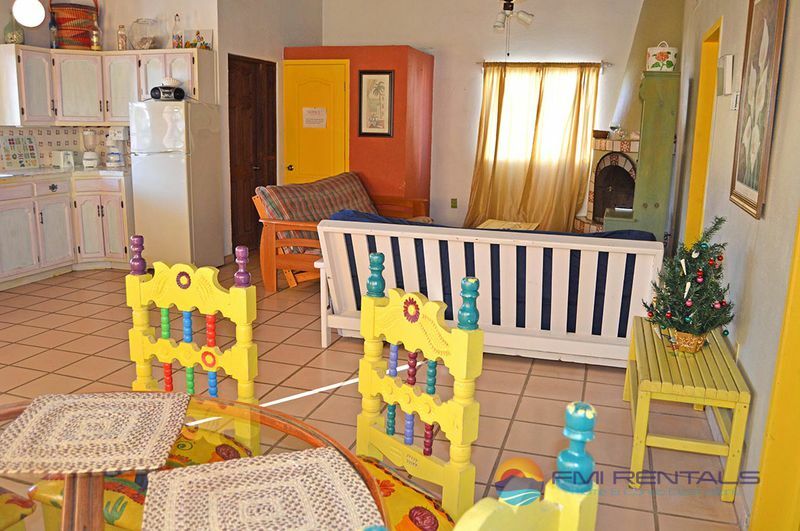 Behind the futons that serve both as a colorful place to sit and a comfortable place to sleep, you will find an enchanting dining area. 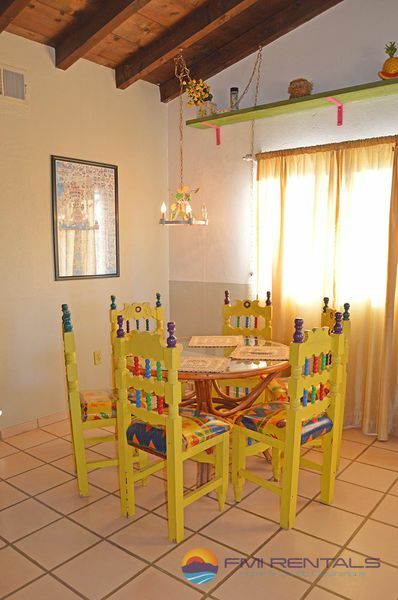 Dark wood ceilings offer a strong contrast to the white walls and the glass table surrounded by 6 of the most enchanting painted chairs - they look as if they could have come straight from the pages of your favorite Mexican fairy tale. 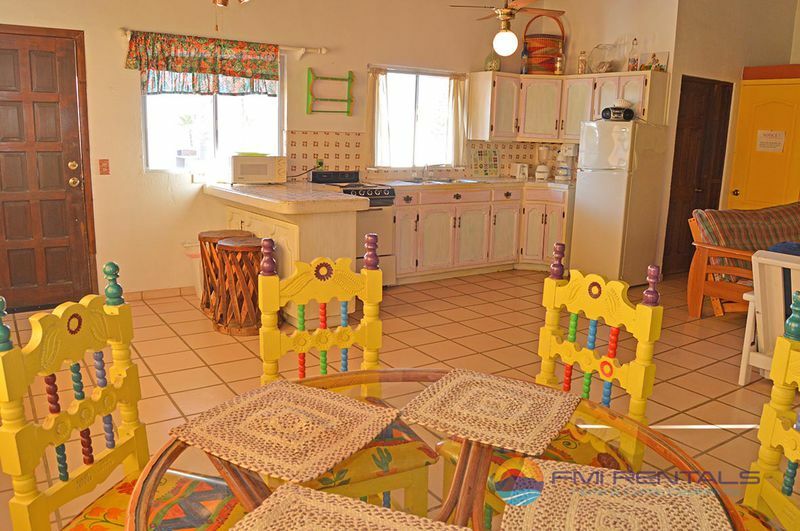 Form and function is a concept you will find in all of our Rocky Point vacation rentals, creating an enjoyable vacation experience! 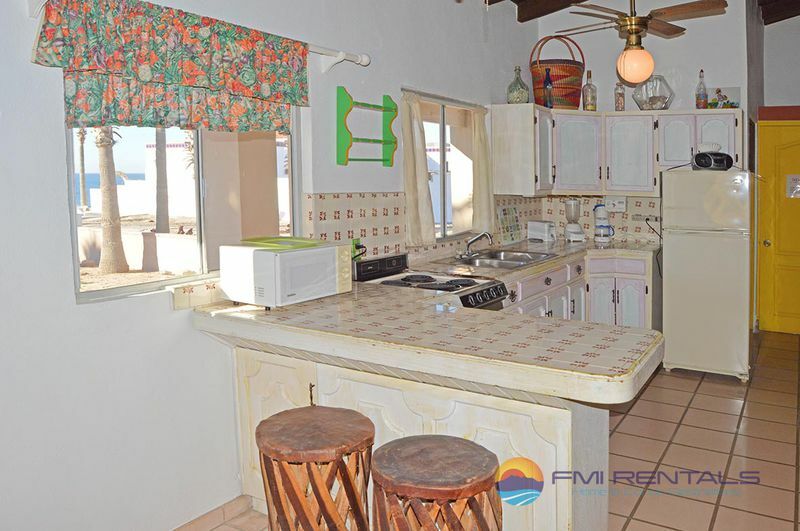 The fully equipped kitchen is spacious and bright, filled with all the necessities of life. 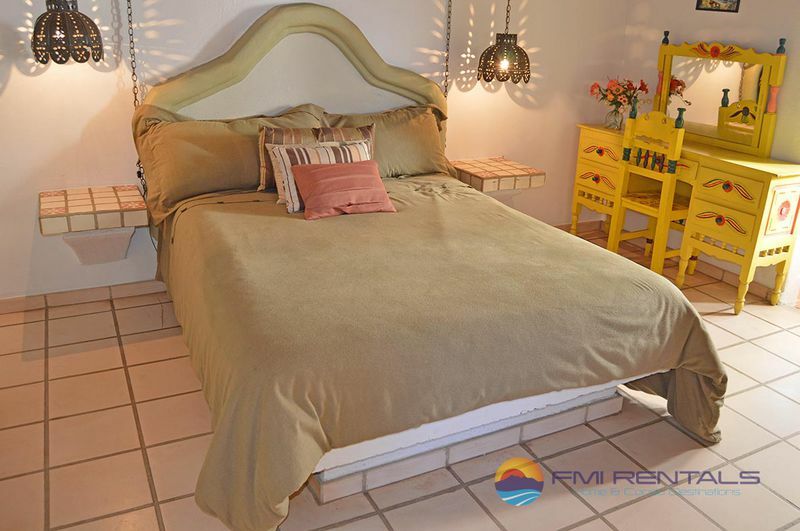 The luxurious queen sized bed in the master suite nestles cozily against the built in headboard, and the tiled floating end tables provide a beautiful and practical accent to the spacious bedroom. 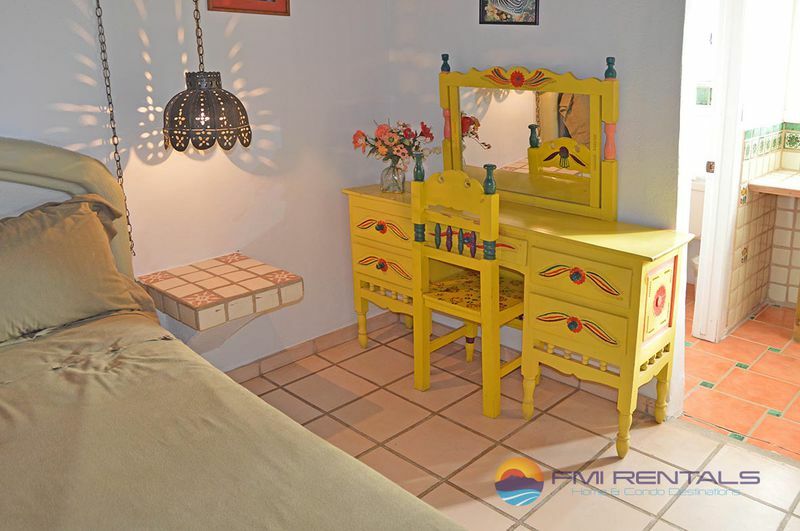 Happy, brightly colored wood furniture pieces are scattered throughout the room, offering plenty of places to store your clothing and other personal items during your stay. 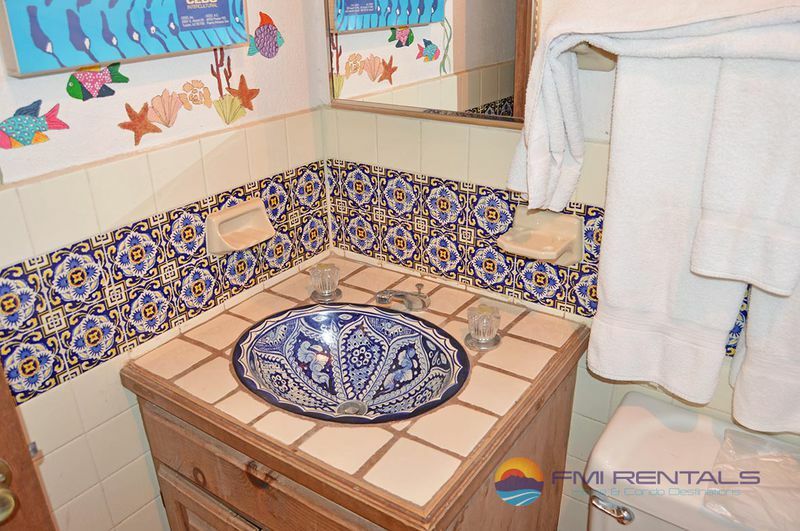 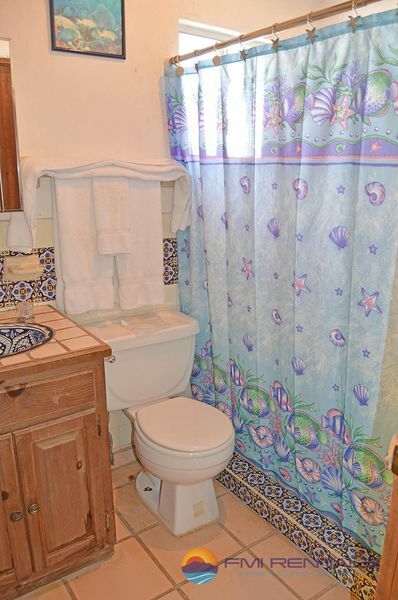 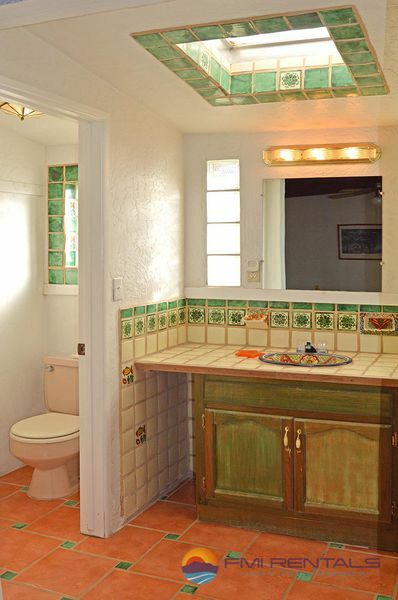 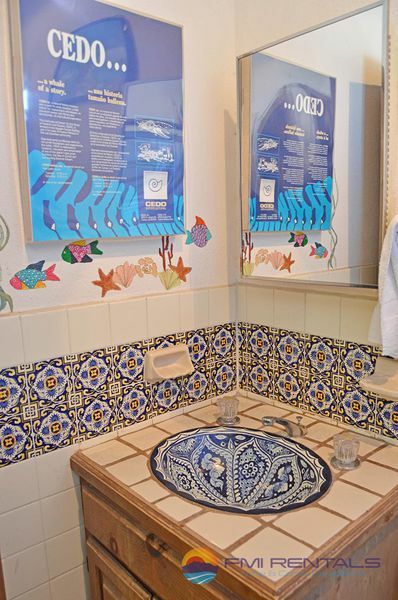 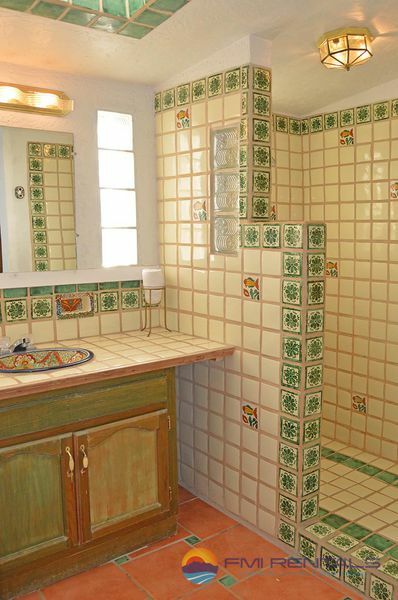 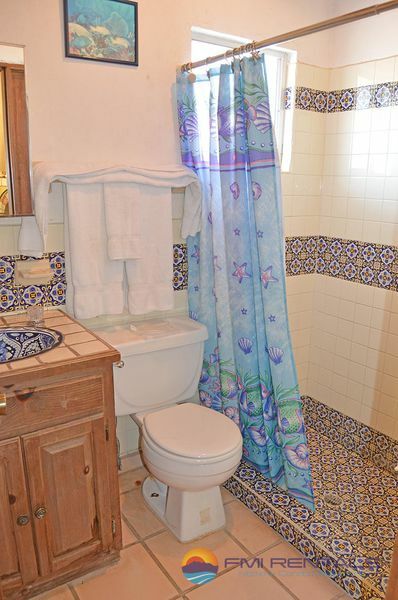 The master bath is a nostalgic nod to days past, evident in the brightly colored Spanish tiles that fill the walls and in the hand painted sink tucked into the vanity. 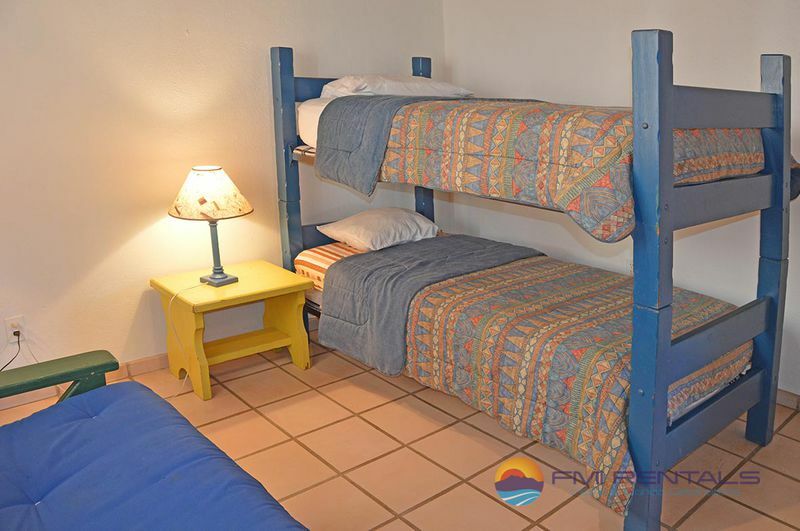 The second bedroom offers bunk beds and another futon, giving your children the opportunity to sleep in the style of vaqueros from days long gone, while the second bathroom is just as colorful as the one in the master suite. 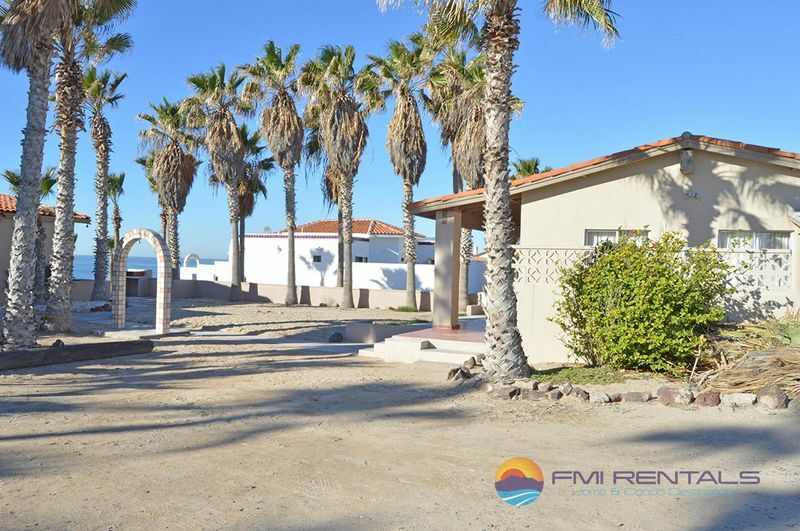 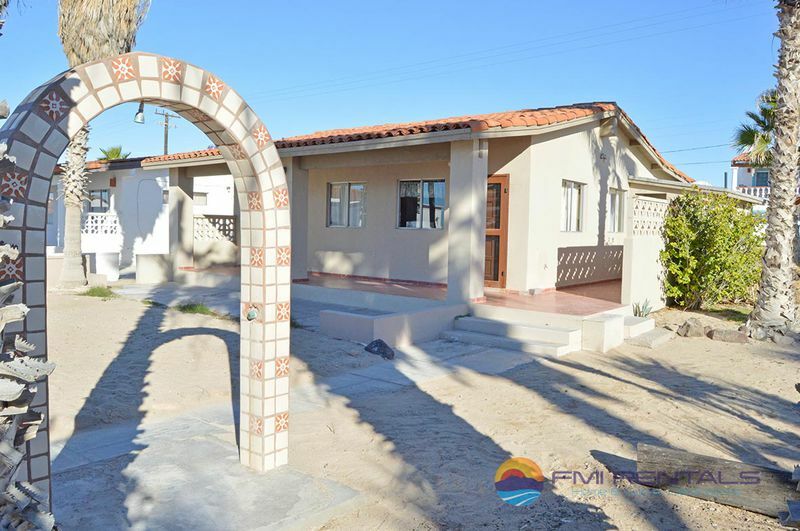 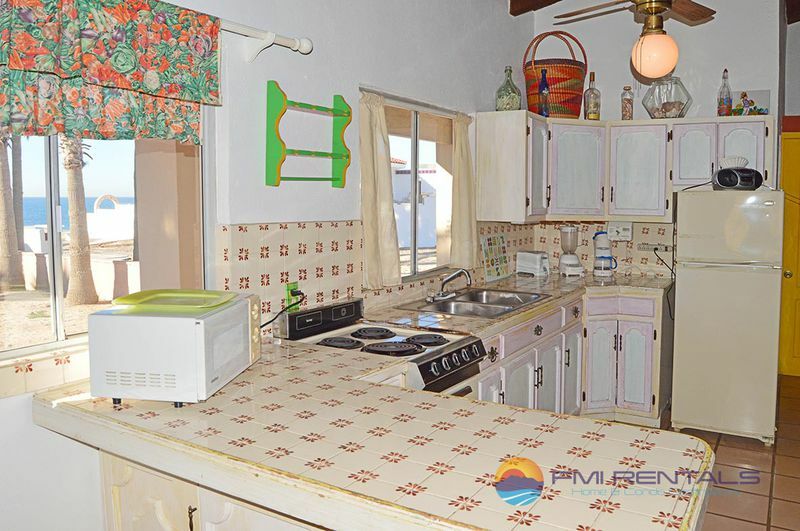 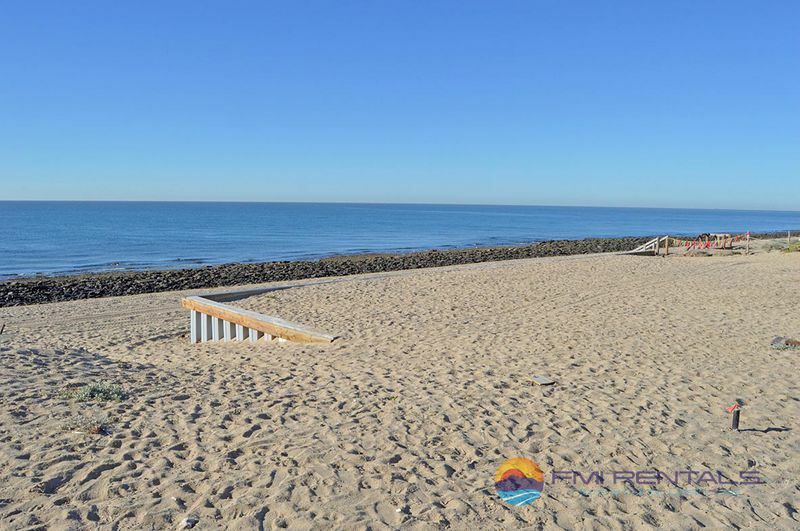 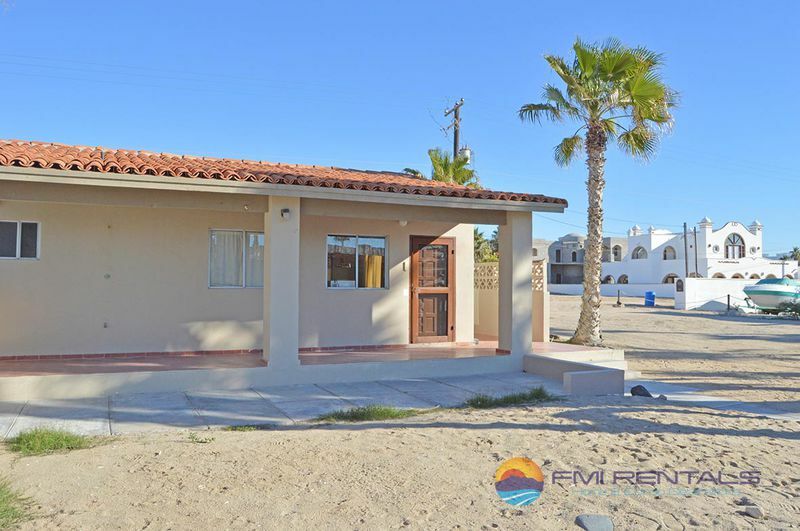 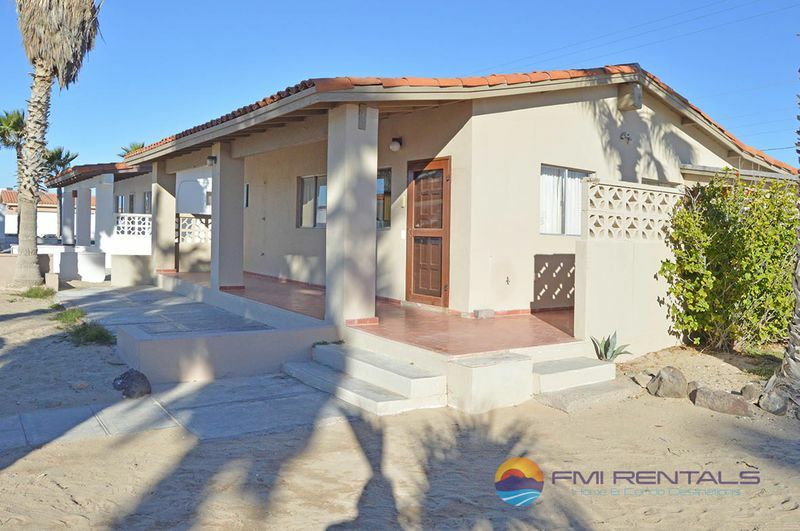 All of our Rocky Point rentals are centrally located - perfect for exploring the town or lounging by the beach, and this charming cottage is located on the beach, not far from the center of town. 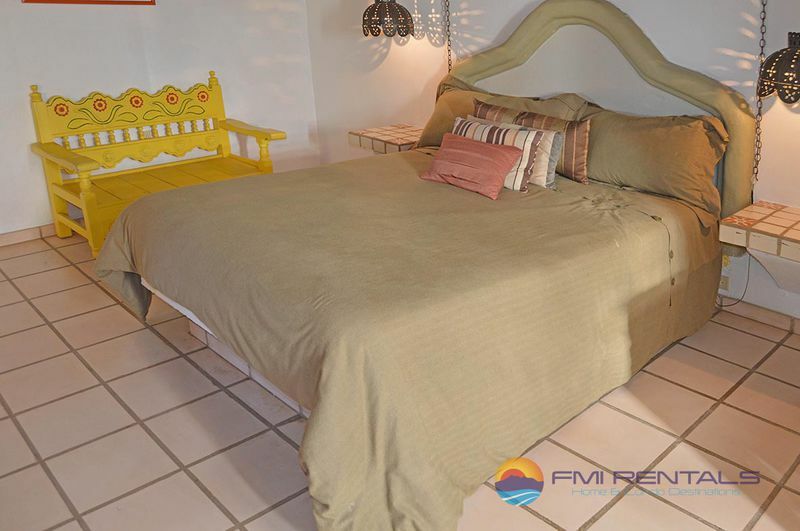 While you are out and about, enjoy a nice Italian meal - yes we said Italian - at the Mare Blu (the seafood here is divine) or stop into the Friendly Dolphin for a colorful meal overlooking the city; don’t forget to try a margarita! 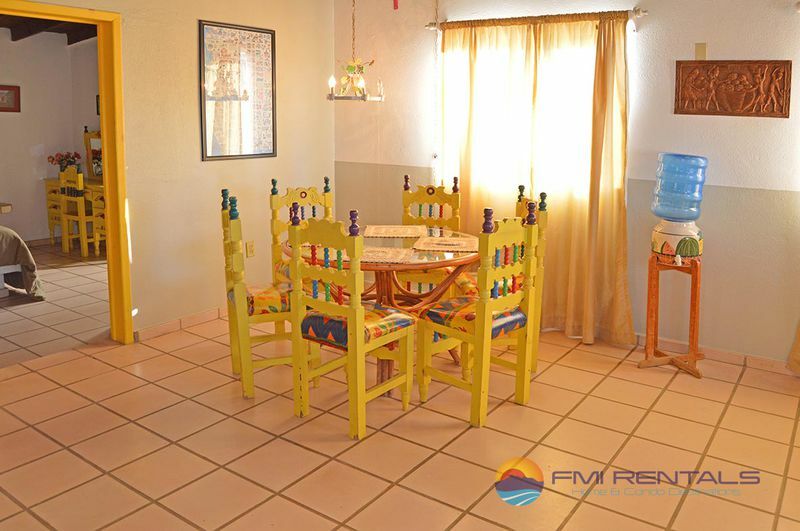 When you’re south of the border, it’s practically a crime not to enjoy a frosty margarita at least once a day during your stay in one of our luxurious FMI Rentals in Rocky Point.